Earn $28.99 in Rewards credit (2899 points) What's This? Park's Premium Home Mechanic Stand has been improved for even easier use. The PC-4-2 moves to the 100-5D micro adjust clamp design. The new clamp allows small adjustment to clamp tension while already clamping and will grip nearly any tube from 7/8” to 3” (23-76mm), including aero tubes. The clamp also features narrow clamping jaws (2.7”/7cm) to fit into tight areas or on short seat posts. I like this stand a lot. I think its the next best thing to a pro shop stand. When you get the legs set properly, its nice and stable and the clamp is robust even with some plastic components. Its a little heavy but it is meant to stay at home not travel and this helps with stability. I've been using an old exercise stand to hold bikes while I do adjustments and work on them - it's so nice to now have a real bike stand I can pop a bike on to, and have it done quickly. I spend more time on the task, and less time trying to keep the bike upright. The Park stand is very stable, well built, but still easy to move around the garage. The engineers at Park really understand us. 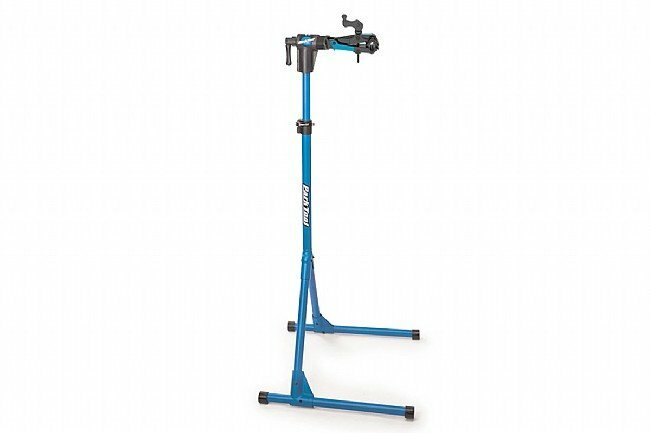 Rock Solid Stability is the Park Tool PCS-4-2 Bike Stand's claim-to-fame . With 4 point gripped footing, and precision-adjustable C-clamp, this stand is a made for home bike repair. Storage is a snap with swing-away legs. It was great until I got my mountain bike on it and started to turn the pedals to adjust the gears. The stand would turn and my bike with it. The top head did not clamp tight. I called Park tool tech support and his best help was to tell me that it's not the top model so that's the way it is. That I could put a sheet metal screw in it but he wouldn't. I was very disappointed. I kept the stand but I am tempted to return it. For $275 it better not move with the bike in it. Other than that I really liked it. Too bad they left one flaw in it when they could have hit it out of the park with a little design change. When companies don't listen to their customers guess what happens? This bike stand is big and strong all in the wrong places. If you have a garage that you can keep it up so it's always there to use then great. But if you have a small apartment and have to put it away after use then you should think about a stand that can fold up easy and store in a closet. This stand is not that kind of stand. This is my third workstand and is exactly what I need for the bikes I have now. My old favorite was basic and heavy and very stable - and great with round tubes. But despite my efforts with foam, fabric and duct tape, it really has never worked well with odd shaped seat posts. I also had a bb clamp workstand but because it required removal of one or another wheel and I am sort of impatient, I found it awkward to use. This stand combines the stability of my old favorite with a great clamp that works with all of the not round things I have clamped in it so far. It is height adjustable and rotates so is going to give me easy access I never had before to work under or at the lower parts of a bike or frame. The downside is that it cost more than I wanted to spend but I looked carefully at the various versions and decided that this one looked like it would be very stable. It has a little bit of give because the attachment bolts are slightly over length but this is very convenient for me as I work on a deck that is not entirely level, so I can kick the base around a little until it feels solid. I assembled this in a matter of minutes and it does fold some for storage. At this point I cannot imagine needing anything additional or different. Very easy to set up, light enough to move around, great all the way around. Stand is stable, adjustable and makes working on bikes a preasure. We repair and restore bicycles. We were using a homemade stand that worked but actually took more time than was necessary to work on bikes. The stand came together easily and the instructions were clear. Like other Park tools that we own and use, this does what is expected. use it for maintenance and repair for my 3 bikes, like all about it, easy to set up and adjust and hold the bikes firmly in any position. They made it better ! I was hesitant to order this stand with the new clamp after using the cast adjustable clamp for years, but it is more intuitive to use. Now you can clamp the bike first and then apply just the right amount of neccesary tension. Working on a variety of different frames is easier due to the super wide clamping ability. Like the original,it is made of metal and built to last. My only minor complaint would be the packaging of the product. It came out of the box with several deep scuffs and scratches. All in, a great stand and a good deal.